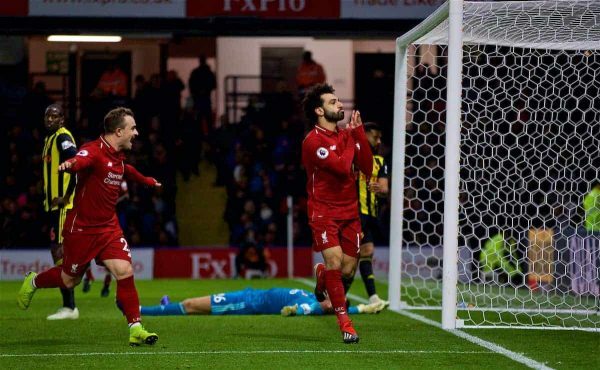 Liverpool extended their unbeaten start to the Premier League season with three goals in an improved second-half display to beat Watford 3-0 at Vicarage Road. A relatively quiet afternoon for the Brazilian as Watford mustered just one shot on target all game. Could have been punished for a sloppy pass early on on the edge of his own penalty area, which Watford were unable to punish. Otherwise untroubled. Followed up his first England goal during the international break with a sumptuous second-half free-kick, whipped over the wall and into the corner at a crucial point in the game to effectively seal the three points. A few lax touches in the first half, but grew into the game and displayed some excellent distribution. Supported the attack well later on. Somewhat jittery during the opening 20 minutes, but quickly settled down and helped Liverpool to yet another clean sheet, dealing well with numerous corners and crosses into the box. A couple of important interceptions and covering tackles in the second half ensured Liverpool never gave Watford a route back into the game. Typically imperious, dominating his aerial battles and mopping up loose balls with his intelligent positional play. Always in control against the physicality of Troy Deeney who was unable to exert the same influence he has done in this fixture in the past. Some trademark raking passes to switch play, and as ever marshalled his team-mates with an aura of composure and authority. 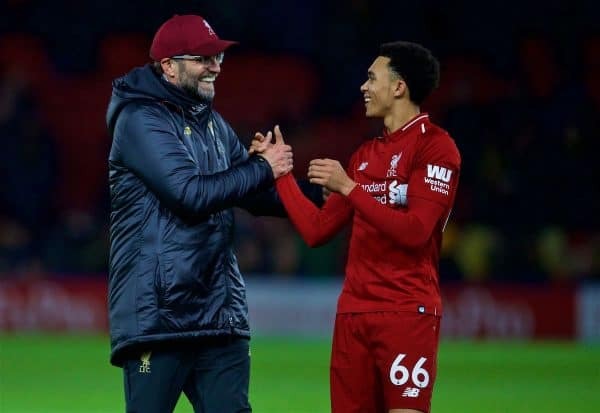 As with Alexander-Arnold, appeared slightly off the pace to begin with and just managed to pull out of a challenge in time to avoid giving away a first-half penalty. 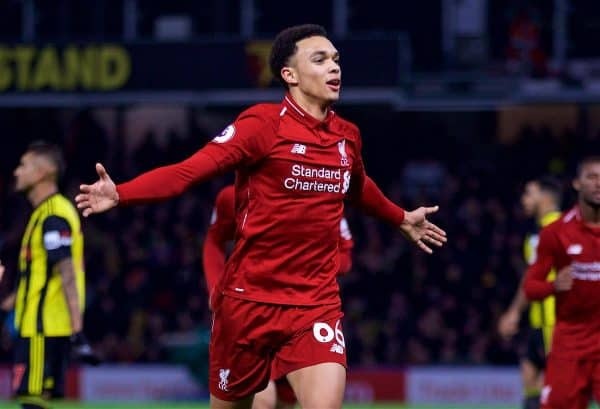 Offered a real outlet with his marauding runs in the second half, used the ball sensibly and played a key role in creating the third goal, driving forward with searing pace down the wing before finding Sadio Mane in the box. A disappointing afternoon for the skipper who was unable to dictate the tempo or control the midfield alongside Gini Wijnaldum. Often elected to play the safer ball when a forward pass was on, and lacked any real drive in terms of moving the ball up the pitch. His frustration showed in the second-half, and his needless second booking felt like a matter of time, clattering into Abdoulaye Doucoure near the halfway line late on, meaning he will now miss next weekend’s Merseyside derby. Similarly to Henderson, Wijnaldum appeared afraid to take any risks in the first half and played well within himself. Gradually started to take on more responsibility, and finished the game strongly with several direct forward runs, keeping possession superbly by evading multiple challenges in and around Watford’s penalty area. Not quite as influential as he has been as of late, but Shaqiri was still Liverpool’s brightest spark in the first half and set up Mane with a clever ball into the box. Faded a little as the game went on and was eventually replaced by James Milner to offer more security in midfield once Liverpool had established their lead. 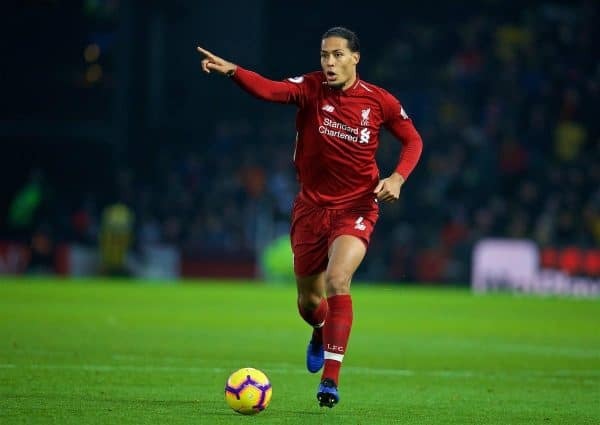 Really struggled to get into the game at all in the first half, dropping very deep at times to pick the ball up off the centre-backs, thus inhibiting his involvement in Liverpool’s forward play. 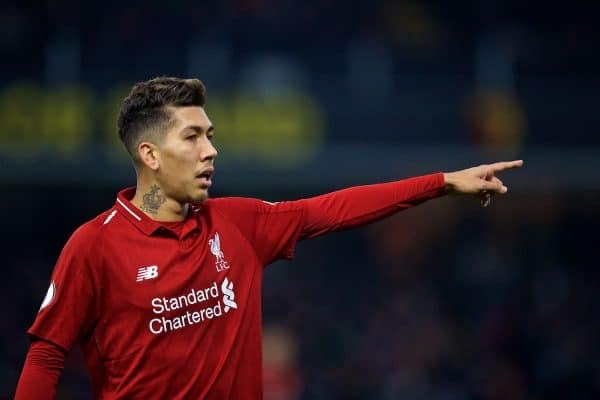 Firmino stepped up notably after half-time, however, and began to dictate the play in a way which we haven’t seen for quite some time. Played a lovely incisive through ball to Mane in the buildup to Mohamed Salah’s goal, and got himself in the right position to nod in the third goal late on—a goal which will hopefully restore some lost confidence after his recent drought. Came closest to opening the scoring in the first half, latching on to Shaqiri’s pass to get a decent shot on target. 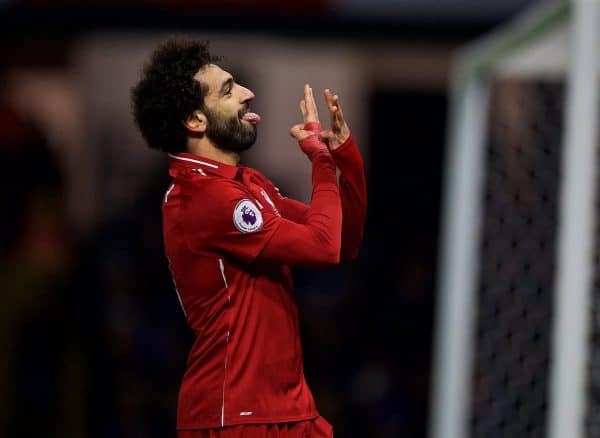 Like Firmino, his quality shone through as the game progressed and it was Mane’s direct run and precise cut-back which created Salah’s opener. Unfortunate not to get on the scoresheet late on, seeing his shot parried by Ben Foster for Firmino to head in from close range. Salah found himself suffocated and marked out of the game for much of the first half, deprived of any space in which to operate. That said, he nearly scored with a well-directed header from Shaqiri’s corner, and eventually made the crucial breakthrough with a neat finish inside the box, fumbled into the net by Foster. Not electric by any means, but yet another decisive contribution which takes the Egyptian on to nine goals for the season. James Milner (on for Shaqiri, 74′) – 6.5 – Offered greater solidity in midfield to help Liverpool see the game out in a calm and professional manner. 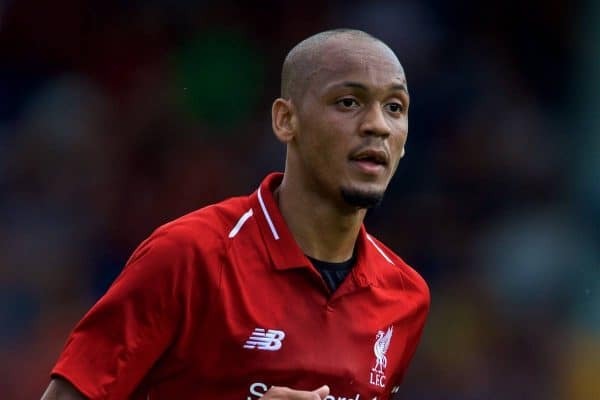 Fabinho (on for Salah, 86′) – N/A – Helped shore up the middle of the pitch for the final few minutes following Henderson’s dismissal. Joel Matip (on for Firmino, 90+2′) – N/A – Barely involved in the final few moments of stoppage time. Went with a fairly bold lineup, opting to effectively field four attackers away from home. 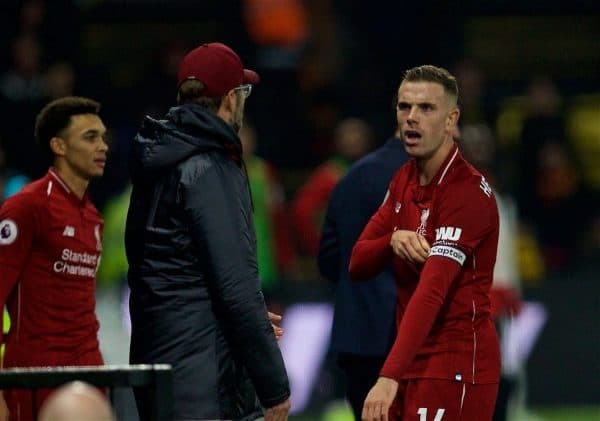 The midfield pairing of Henderson and Wijnaldum didn’t quite have the right balance, however, and was too safe and predictable during a frustrating first half. His patience paid off, though, making no changes at half-time and then bringing on Milner for Shaqiri to kill the game once Liverpool got themselves in front. Overall, a very competent performance, three points and another clean sheet in what has previously been a very tricky hunting ground for the Reds.